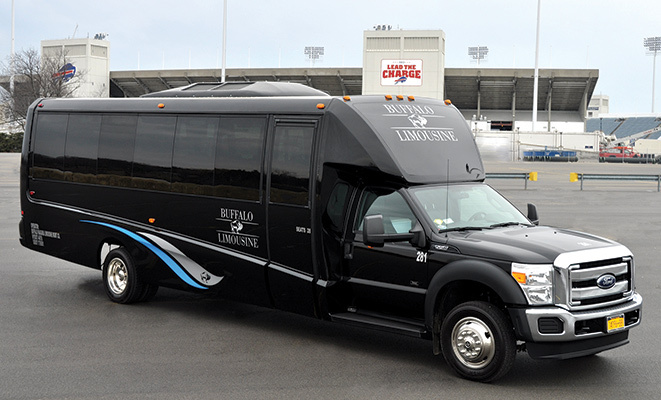 May 2014 Edition , Buffalo Limousine….making Buffalo Proud! The next generation of Buffalo Limousine carries on the tradition of detail-oriented service. In the chauffeured transportation industry‚ a good company lets no call go unanswered. When the phone rang one day in 1961 at the Patti family’s funeral business‚ Mortuary Service‚ Camille Patti answered‚ not knowing that this call would change the path of the company forever. On the other line was a friend who knew a local concert promoter looking to rent five limousines to get his group to a rock concert. They had the vehicles‚ but Camille wasn’t sure what to charge. She settled on $25 per car and the promoter agreed. However‚ her husband‚ John Patti wasn’t as agreeable. He was concerned about damage to his vehicles‚ who would be willing to drive them so late‚ and who would clean the vehicles. But they did the job‚ the promoter paid in cash that night‚ and Buffalo Limousine was launched. This side of the business took off‚ and within a few years‚ the Patti’s discontinued the funeral business and focused on marketing the high-end limousine and sedan service. The rest‚ as they say‚ is history. More than 50 years later‚ Buffalo Limousine is still going strong. Carla Boccio and her husband Frank purchased the company from her parents in 2000‚ and partner John Arnet joined the company in 2005 after running his own transportation service. Together‚ the trio has taken it to new heights. Running Buffalo Limousine was not something Boccio necessarily saw herself doing growing up. Sure‚ she worked in the business for a while‚ along with her sister and brother‚ but she spent time away exploring her own opportunities. She eventually moved back home and later married Frank‚ one of Buffalo Limousine’s chauffeurs-turned-owner-operator. After raising two kids‚ Boccio felt ready to jump into the business full time. “My parents had been working in the business for 40 years‚ and they had the right to slow down‚” Boccio says. “But even today my father is still involved. He never had a hobby. He would eat‚ sleep‚ and drink the limo business. When I talk to him‚ he wants to hear about things in this order: business and then family. In fact‚ many of the practices implemented by Patti helped Buffalo Limousine climb to the top in its market. While building on the burgeoning entertainment work coming through Buffalo‚ the company also targeted businesspeople looking for rides to and from the airport. According to Boccio‚ in the early 1960s‚ companies charged a three to four hour minimum for airport transfers. Patti decided to offer a flat-rate transfer. Today‚ corporate work is the meat of Buffalo Limousine’s business. Its fleet is comprised of 24 all black vehicles: Cadillac and Lincoln sedans (including the MKS and MKT)‚ GMC SUVs‚ two black stretches‚ a Mercedes-Benz Sprinter‚ Van Terras (with forward-facing and limo-style seating)‚ executive minibuses‚ and limobuses for up to 28 passengers. Outside of affiliate work‚ Boccio attributes much of the company’s success to Buffalo itself. New York’s second biggest city‚ Buffalo is a big draw to tourists from all over the U.S. and abroad thanks to its proximity to Canada. The region of Buffalo and Ontario welcome upwards of 30 million tourists annually. Often referred to as “The City of Good Neighbors” because of its inhabitants’ friendly nature‚ Buffalo is synonymous with the “Buffalo wing‚” which originated here and remains a staple in tourist cuisine. Nearby Niagara Falls is‚ of course‚ one of the world’s natural wonders‚ and Boccio says she is still amazed at how many people come to see the falls. But Buffalo is more than chicken wings and waterfalls. A hub for health care‚ education‚ technology‚ and banking‚ the city is experiencing a rebirth‚ according to Boccio. Despite lagging economies elsewhere‚ Buffalo is booming‚ due in part to expansion from major universities as well as the Buffalo Niagara Medical Campus‚ with health care‚ life sciences research‚ and medical education institutions on 120 acres in the downtown area. “Buffalo is up and coming‚ and they are trying to attract talented medical professionals by rebuilding the downtown and this medical campus‚” says Boccio. Not to mention‚ upstate New York’s popular Finger Lakes wine region is carving out a niche that rivals Napa Valley‚ offering wine tours on both sides of the border. This‚ in addition to the sports venues‚ like Ralph Wilson Stadium where the NFL’s Buffalo Bills play‚ and First Niagara Center‚ home to the NHL’s Buffalo Sabres. The city’s newest mixed-use complex‚ the HarborCenter‚ is currently under construction and when finished will provide retail space‚ two indoor ice rinks‚ and a hotel. Buffalo has benefits specifically in the realm of chauffeured ground transportation as well. Many Canadians will fly out of Buffalo Niagara International Airport because it offers lower tax and airline surcharges. But for Americans crossing the border‚ chauffeurs have a Nexus pass‚ which can save a client from missing a flight with backups at the bridge. Boccio sees this as an advantage for affiliate work. The company also maintains a satellite office in St. Catherine’s‚ Ontario‚ for trips exclusively for Southern Ontario. Chauffeur training is handled by John Arnet‚ a former ground transportation company owner himself‚ who joined Buffalo Limousine as a partner in 2005. Arnet handles bookkeeping responsibilities and shares operations duties with Frank. The three partners also take turns answering calls overnight and on weekends—a testament to their commitment to the 24/7 model. Training is one on one and can last up to 30 days‚ starting off with the late Tom Mazza’s training videos. “We love these videos still‚” says Arnet. “They are a good introduction to what the daily life of a chauffeur is.” From there‚ chauffeurs are taught procedures and major hot spots around the city. Vehicles are equipped with GPS tracking and cameras‚ which chauffeurs were hesitant about at first‚ but embraced once they realized how it would protect them and the company when there’s an accident. Arnet also worked with Mazza in person through his 20 group‚ which the late industry consultant facilitated. He is now a member of Andi Gray’s learning and development group‚ which formed last year. Gray is a longtime business consultant and the founder of Strategy Leaders. Patti built the foundation for Buffalo Limousine and Boccio says keeping the company healthy is a top priority. Continuing to grow the farm-out side of things is one part of the equation‚ and the revitalization of Buffalo will play another major role. “In five to 10 years‚ I see the American side of the falls becoming a booming place‚ and we’re on the ground floor of this development‚” Boccio says. Feature Stories – Chauffeur Driven Magazine.